Highly sensitive microphone. Impedance: Low. Plug Type: 3.5mm stereo plug x 1. Cable: Approx.1.2m /-0.3m (rubber cable). Frequency Response: 30Hz to 16,000Hz. deal for use with the internet conferences as well as music/voice recordings. An original Shure Beta 57 dynamic microphone. All original parts with the exception of the clip which is from the 00s. 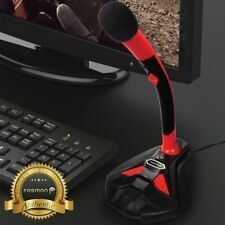 TRIXES Microphone Mic for Laptop PC Computer MSN Skype Yahoo Web Chat Gaming Online. Internet Voice Chat. (MSN,Skype etc). PC & Laptop Accessories. Multi Player Internet Gaming. Compact & Lightweight - great for network users. Compact size ideal for travelling. Plugs into a standard 3.5mm microphone jack. Omni-directional microphone for notebooks. 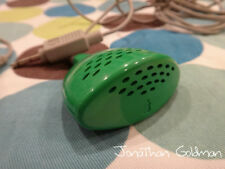 Windows 7 General Microphone Enabling Help PERFECT FOR TRAVEL. GET MORE FROM YOUR LAPTOP. Marantz Professional. The kit consists of a high-quality USB condenser microphone paired with a fully-adjustable suspension boom arm, keeping the desk clear and the microphone always in position for podcasting, on-air or voice-over applications. Here is a Blue Yeti Black version computer condenser Mic. The Gold Standard of computer mic's. Yeti is the best quality USB microphone that can capture any sound with 16-Bit/48 kHz res. Transducer: Condenser Microphone. Style: Gooseneck Microphone. Communication: Wired. Set Type: Single Microphone. Use: Computer Microphone. The 10.8" long mic can be used in conjunction with any camcorder, professional or amateur, and any video-capable DSLR / HD-DSLR. Its durable aluminum construction makes it great for indoor and outdoor shooting. We have a number of these array microphones removed from university conference center. All are in excellent condition with factory box, microphone bar, ceiling mounting plate, USB cable, audio cable and instructions. Vidpro XM-55 Shotgun Microphone Kit. The 10.8" long mic can be used in conjunction with any camcorder, professional or amateur, and any video-capable DSLR / HD-DSLR. Its durable aluminum construction makes it great for indoor and outdoor shooting. Mini microfono con cavo flessibile. Microfono altoparlante per computer, pc, notebook e laptop. Connettore: jack 3.5mm. Dai un occhiata alla nostra PROMOZIONE! Facile e comodo da usare. You are looking at a NEW Factory Sealed Razer Seiren X Microphone! Box shows shelf wear. Designed and tested by top streamers, the Razer Seiren X is your key to getting heard in the mightiest way possible. Backed by the best microphone technology, its the first step to taking your live streaming to new broadcasting heights. Shock Resistant - Built-in shock mount that dampens vibrations Ultra-precise pick-up pattern - Reduces unwanted background noise Compact form factor - Keep the attention focused on you Condenser Mic - To pick up a greater range of sound frequencies Zero Latency Monitoring - For zero audio lag Bid with confidence, check our feedback and know that we guarantee customer satisfaction by offering a full refund if you are not happy with your purchase. Restock fee may apply. The microphone strategically filters unwanted background noise and features a built-in shock mount to dampen vibrations. To ensure it fits your gaming setup perfectly and professionally, it's constructed to be sleek and non-obstructive, allowing your audience to see more of you. And, there's no software or hardware required in this USB-connected device. This mic features noise-reducing technology to keep your voice crisp and clear to those people or Pivot. The mic pivots on a weighted, stable base -- this lets you position it optimally, and will hold its position. Noise-cancelling microphone filters out unwanted background noise. Power switch illuminates when microphone is active. 1 X Mini Usb Microphone. Automatically shielded built-in sound card microphone of computer certain computer will not shield which only manually switch once. Sehr qualitativer Mikrofon. Mit 3,5mm Mikrofon Stecker. Der Mikrofon selbst ist 5,5cm Lang, sehr klein. Mit Kugelgelenk zur optimalen Ausrichtung. Kabel: 1,80m Lang. andere Sprachen können wir mit Hilfe von Google Übersetzer antworten, die Übersetzung kann jedoch Fehler enthalten. 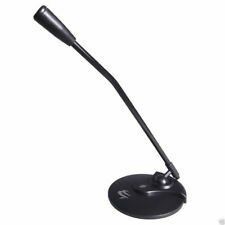 Black 3.5mm Audio Microphone Mic For Laptop Netbook. Headphone jack: 3.5mm. 1x 3.5mm Flexible Mini Microphone. Flexible cable designed for angle positioning. Net weight: 14g. Plug and Play. 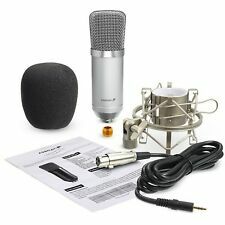 Mini Portable Wired USB 2.0 Condenser Online Video Chat Skype Mic Microphone. The SF-555B is a portable and practical USB 2.0 condenser microphone, which adopts USB 2.0 plug to make it work with any USB-equipped computer, features noise-canceling design, and is specially designed for chatting over MSN, SKYPE, singing over Internet and gaming. • Plugs into the 3.5mm AUX headphone port. • Frequency range - 20 to 20,000 Hz. Why Buy From Us?. In good condition, great buy!! This item is pre-owned but has been tested and is in good working condition. INT ERN ATI ON AL SHI PPI NG. The Yeti Studio all-in-one professional vocal recording system gives you the tools to record with stunning quality and ease. Create like a pro using Yeti, the world’s most popular USB mic, together with custom recording software from PreSonus® and advanced studio vocal effects from iZotope®. Lightly used lots of life left - pics show the unit working and is synced to the base. With this model you can change the battery yourself no need to send it to manufacturer to change it whereas with the prior models when the battery goes dead in the microphone you need to send it back to Revolabs to get a new battery put in. High Sensitivity Headphone Mic. During that process you will be issued with an RMA number. It has a rotating cable mount for easy positioning and ideal for pointing microphone in correct direction. (1) Beyerdynamic DT 240 Professional 34-ohm Studio Recording Closed Headphones. Crystal-clear recording demands the right tools for the job. Beyerdynamic DT 240 Professional 34-ohm Studio Recording Closed Headphones. With Snowball iCE, quick and easy recording is finally a reality. Simply mount Snowball iCE on the included adjustable stand, plug the USB cable into your Mac or PC and that’s it. Snowball Computer Microphone iCE. This little USB microphone makes adding a mic. to your Raspberry Pi or computer super easy! It's ideal for adding basic sound capture to your projects. is active. Mini USB Microphone. NEW OMNI REACH ADJUSTABLE 54dB MINI MICROPHONE 10 X 7MM. This very compact microphone is ideal for any notebook or computer user who wants to have conversations via the internet. • Direction Type: Omni. The kit features a high-quality condenser microphone paired with a fully adjustable suspension boom arm. It can be used to keep your desktop clear and the microphone positioned for podcast, on-air, or voice-over applications. • Cable Length: 10cm. • Connector: 3.5mm Male AUX. • Flexible cable to create angles for your Mic. • Supports Plug and Play. • High quality and Durable for long life use. • Light weight and Stylish. Samson Go Mic Portable USB Microphone. USB microphone designed for performing vocals, chatting or podcasting. Also compatible with VoIP, including Skype. 1/8stereo headphone output for zero-latency monitoring. Typ: Kondensatormikrofon. - 3,5mm Stereo Klinkenstecker passt z.B. in Mikrofon Ausgang an PC, Laptop, Smartphone. - 1 x Clip zum anstecken. - 1 x Mini Kondensator Mikrofon. - Eine Schaumkappe schützt Ihr Mikrofon vor Windgeräuschen und spucken. ML-HRC-027 (1/L-5x4x1) ML. Salesbaron is in Los Angeles, 90039. The Yeti Pro is the world's first USB microphone combining 24-bit/192 kHz digital recording resolution with analogue XLR output., the Yeti Pro is your ultimate sound solution. Or, if you want to take a break in the middle of a podcast, use the instant mute button. New - Labtec AM-240 FlexiMount PC Microphone in Original Unopened Package!